This post is about Kumamoto where I live again. In Kumamoto city, the tram cars run around downtown. I sometimes see a tram painted colorfully. 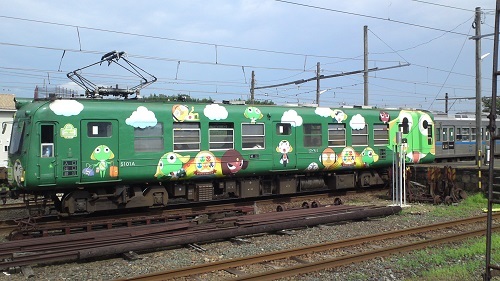 The other day, when I was driving my car, the Keroro tram passed by me. Have you heard “Sgt. Frog” (Keroro Gunso)? It is a popular cartoon in Japan. 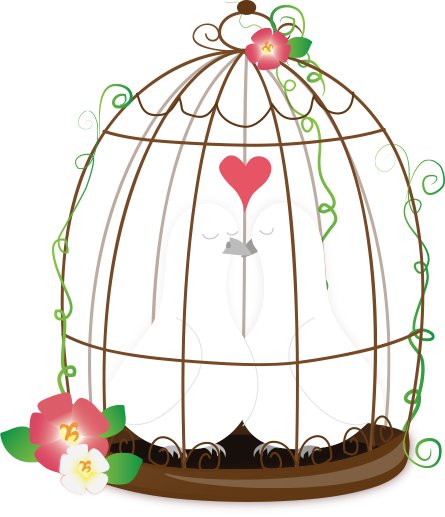 Check out Wiki. This comic artist grew up in Kumamoto. 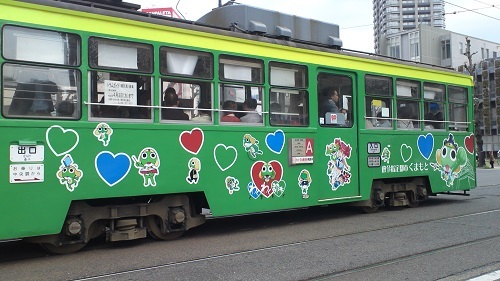 Here is another Keroro tram. I watched Sgt.Frog on TV for the first time when I traveled to Hong Kong. He seems to be popular even overseas. In the tram, Keroro announces the next stop. His voice is very cute.